Are we quite sure P.T. Barnum hasn't pulled an elaborate hoax on us, and is actually alive, well, and directing The Greatest Showman? A wild, flashy, grandiose spectacle with larger-than-life characters, performances, musical numbers, and is also a little bit of a con, Hugh Jackman's passion project embodies the infamous master of hype and the man who put the show in show business. If it had been anything less we would have said The Greatest Showman doesn't live up to the outsized ego of its subject. If you're coming in expecting a point-by-point P.T. Barnum biopic then I will kindly direct you to his Wikipedia entry. You also don't know Hugh Jackman very well. "The Boy from Oz", who has been developing this film for years and taking on one Wolverine movie after another to get Fox's greenlight, spins Barnum's career as a carnival barker, charlatan, and exploiter of the downtrodden into a roaring anthem on individuality and personal freedom. Shallow in its themes it may be, but boring The Greatest Showman definitely isn't, and the litany of catchy tunes will be in your ears for weeks. Born the son of a poor cobbler, Phineas Taylor Barnum was never expected to amount to much, certainly not enough to win the heart of his first love and wife Charity (Michelle Williams), but he risked everything to go above his station in life and dazzle the world . After a serious of middling jobs he cons his way into enough money to start a museum, but it's at his daughters' suggestion that he needs "something alive" that Barnum sparks to a new idea. When he meets the dwarf Charles Stratton (Sam Humphrey) and rechristens him General Tom Thumb, Barnum has the beginnings of a showcase of oddities that appeals to the masses while making him the target of the elite. Barnum puts on a good show, literally, by convincing other marginalized members of society to flaunt their "gifts" and not be ashamed. There's the musically-gifted bearded lady (Keala Settle), the heaviest man in the world, and every circus needs a dog-faced boy. The cappers are Anne (Zendaya) and W.D. Wheeler (Yahya Abdul-Mateen II), a pair of African-American trapeze artists who find that no matter how high they soar all people see is the color of their skin. But finding success entertaining the rabble wasn't enough. Barnum still sought acceptance from the upper class, teaming up with young hotshot playwright Philip Carlyle (Zac Efron) to be his foot in the door to the wealthy class. After entertaining none other than Queen Victoria herself, Barnum sought further legitimacy by going on tour with Swedish opera singer Jenny Lind (Rebecca Ferguson), while marginalizing his family and the less-attractive acts that made him famous. It's a lot to take in, and sometimes it feels like the movie is just too busy for its own good. There are so many themes and perspectives on Barnum that they frequently clash, and undermine aspects of his life that deserve more time, like his crumbling family structure. The same goes for a sweet, beautiful love story that develops between Philip and Anne I think best encapsulates the film's thoughts on race and class. When the two find themselves high in the air performing a lovely little number it is both a striking visual and a resonating duet that best highlights Efron and Zendaya's instant chemistry. They could have built a separate movie on it. First-time director Michael Gracey might have been overwhelmed if it wasn't for the presence of Jackman, who threads every boisterous, floor-stomping performance with his magnificent skills and charisma. A highlight, one of many, finds Jackman in a barside romp paired up with Efron, an electric combination if there ever was one. It's just flat out exciting to see them doing musicals again and for the first time together. We may never see it again so just enjoy it. While La La Land songwriters Benji Pasek and Justin Paul fill every tune with big hopes and big dreams guaranteed to get the crowd out of their seats, they all begin to sound like a climax to a tale that threatens to overstay its welcome. There were multiple times I thought a song signaled the end of the movie, only to discover there were many more left to come. 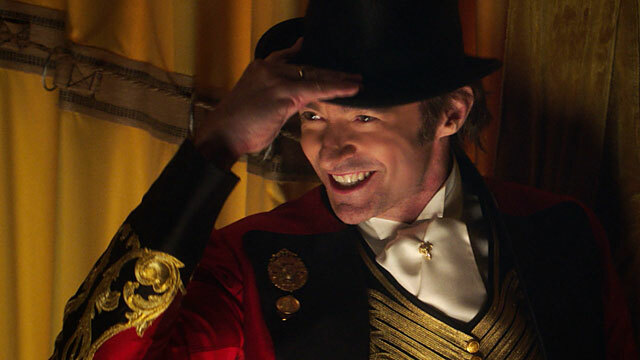 The Greatest Showman is more than happy to cloud Barnum's exploitation of his performers and scandalize his relationship with Lind (They were business partners and nothing more), while easily forgiving his shortcomings. That said, if Barnum was still a man ahead of his time and, regardless of his preference for "humbug" (what he called "hype") he was able to merge his talent as a salesman with his belief in equality and tolerance. If focusing on Barnum's most glowing trait is what it took for Jackman to get his raucous, hugely entertaining show off the ground then I'm okay with that.